You ever been watching an old movie and wondered just how much the prices then compare to now? Drove me nuts. So I looked around and found this site. So when Bogie asks for a dime to make a phone call in 1941, that’s a buck and a half today. A small chunk. When John Huston drops a silver dollar into Bogie’s palm in 1948, that’s a ten spot today. Not bad. It’s a fun toy to play with, this site. Inevitably, though, you start applying it to your own life. Turns out I paid nearly $40 to be deafened by Deep Purple in 1974. and that beat up Buick Opel I bought for $350 would be $1800 today. $1800 seems a bit much for that heap now. There’s a gnawing sense that maybe the concept of $350 then wouldn’t match the concept of $1800 now. Did I really think of it the same way. Did $350 then seem like $1800 does now? I have no idea, and it’s me I’m talking about. Me thirty nine years apart. I can’t tell. I was making nearly $12 an hour in 2012 dollars at that silly-assed little job in 1979. I quit that job to be in my first punk rock band. Lifestyle issues. Work started at 8 am. I was partying till 4 am. Either the band or the job had to go. You guess which. Now it gets less fun. I took the going rate for what I do now and see what that would have been in 2003. Turns out my pay today would be a little over half of what I made ten years ago. Of course, there was all kinds of overtime then. There’s none now, or it’s unpaid (if you work in an office, you know how that works.) So when you figure in my weekly take home then versus now in 2012 dollars, I am making half or what I made then. That’s right, 50% less. If I go back to 1993, when I first began in my chosen profession, I am making the same as I was twenty years ago. It’s like the last twenty years never happened. Of course gas is higher now (even accounting for inflation), and medical insurance is much, much higher. So I am actually earning less now than when I started out twenty years ago. A lot less.That is not only depressing, it’s astonishing. Part of that whole growing income disparity we’ve been hearing about. Of course, I’m not the only one. This applies to the American middle class across the board. Not everyone, of course. In fact a segment has done very well. That top 20% of the US, the ones who have 85% percent of the property and over 90% of the liquid cash (i.e., real money), they’re doing terrific. There are many, many more wealthy than there ever were before, if you drive around southern California you’ll pass though vast swathes of suburbia that are devoted to them. Their big beautiful houses and expensive eateries and stores selling ridiculous things. The problem is that the other two thirds or so of the middle class have been losing ground. Their wages have plunged up to 50% historically, compared with ten or twenty years ago, and they pay much more medical costs, much more for a lot of essentials. Many of the have mortgages set bubble high, and that housing bubble burst a long time ago. You keep hearing about the disappearing middle class, you can see it when you use a little inflation calculator like this. Seeing how much you make now would have been a decade or two ago. In most of your cases, it is very depressing. Now let’s get to my point, which is jazz, and where it’s gone, or really where the fans have gone. Well jazz was a middle class music. Some rich people, sure, but not so many…they were much more into putting on the tux and listening to classical music. That’s rich people music. They keep symphonies going. Jazz clubs were filled with people making a good living working hard for decent money, all the middle management people or civil servants or academic types. They weren’t rich, they weren’t poor, they were what was once thought of as the backbone of the country. Now the wealthy are the backbone, the job creators, the ones to whom we all look to hire and pay us and keep us off the dole. Sometimes they’re jazz fans. We in the middle class don’t make much money, and more often than not a lot less money, but we get by. We just cut out the extras. The new car, the overseas vacation, the nice restaurants. The jazz. We have to cut out jazz. Most middle class people cannot afford to go to clubs anymore. We stay home, listen to CDs and the radio and remember all those nights hearing some of the greatest music in the whole world. It’s not the first time economics has throttled the music. The Depression wiped out the music of the 1920’s, all that hot and wild stuff. Record sales crashed by 1931, rock bottom, clubs and music halls closed, musicians nearly starved. The end of Prohibition, closing all those easy money speakeasy’s, just piled it on. Jazz recovered, but it emerged a different thing, big bad swing, selling to kids with a little change jingling in their pockets. That thrived until the economic and social dislocation that followed World War II when the crowds dried and the big bands had to bust up, a virtual mass extinction. It was all crooners and R&B, and be bop changing everything from the inside. Jazz recovered again, but was much smaller…smaller bands, smaller clubs. Still, there was money in it. Labels thrived, and musicians made a living. This lasted a whole generation, during rich the music reached its creative apogee. Virtually every one of the major figures in jazz was from this time. Even the big bands that had lasting influence — Basie and Ellington and the rest — worked during this period, no matter how far back in history they went. And this was a period of fairly steady economic growth, rising wages and am expanding middle class. Your average Joe could afford to buy lots of jazz records, and there were lots of jazz records to buy. Your average Joe could afford to go to jazz clubs. Basically your average Joe could afford to be a jazz fan. The economy went into a steep dive in the seventies and the middle class took a beating. Jazz hit the skids too, the fans disappeared, record sales dropped, there were less clubs. Fusion thrived at first, but it too lost steam by the end of the decade. The decline has always been marked up as a generational thing, rock music taking over, which was certainly true. But I wonder if the miserable economy that went on a good ten years had anything to do with it. I’m inclined to see it that way. Economic growth picked up in the early 80’s but so did a rise in wage disparity…the middle class receiving less, the upper class more. This trend continued through the early 90’s, a little more each year. It leveled off somewhat during the rest of the 90’s, then renewed again in the 2000’s, until by the time Wall Street and the housing markets caved in 2008, the middle class was already shrinking, battered by the inexorable decline in their wages and benefits, outsourcing, jobs going abroad and corporate consolidations. Going out to clubs once or twice a week–which is what jazz needs to maintain an audience–became a financial risk. You spend too much money. Audiences were already dropping in 2007, even though here in L.A. there was a sudden increase in venues. Then came the crash. The stock market crashed. The housing market crashed. Jazz crashed. Audiences dwindled. Clubs folded (or stopped booking jazz) at an incredible rate. The middle class had been on the ropes for nearly thirty years and in 2008 caved in completely. Venues–and businesses in general–that catered to a middle class clientele struggled to survive. Those that drew the upper class mostly held their own. And that trend included almost all jazz clubs in Los Angeles. The high money places tended to survive, the smaller joints like Charlie O’s or the Cafe 322 went under. I can count the surviving full-time jazz venues on the fingers on one hand, and not even bother with the thumb. And CD sales? You van make the top ten in the national sale charts by selling hundreds of compact discs. Hundreds. I wouldn’t take this analysis too seriously. It’s just opinion. I’m not an economist, or even a businessman. I was just a jazz critic. And I know there are all sorts of reasons I haven’t even touched on, mainly generational. And maybe the music is stuck in a stylistic rut. All the various things you hear people say. But I’ve just had a nagging suspicion that maybe economics had a lot to do with it. This came to me as I wrote my jazz column in the LA Weekly. 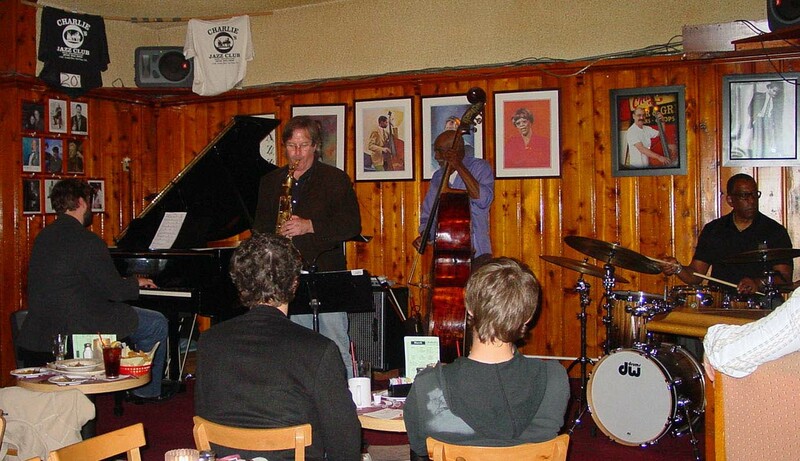 When I began in 2004 there were a lot of jazz joints out there. And often a lot of people in them. The number of people began to drop off in 2007, something I could tell both from personal observation and from the complaints of the club owners I dealt with. Then in 2008 the numbers plummeted. Scary. It picked up a bit as people got used to the new economic reality, but those people weren’t buying dinners anymore, and were buying less drinks. Some weren’t spending any money at all. But even that audience began to disappear. There were bright spots–the Blue Whale, Vitello’s, the occasional Jazz Bakery shows scattered around town. Vibrato kept at it, Catalina still booked jazz gigs, maybe an occasional few others. But they’re wasn’t much else.. Gigs disappeared, and fans were few and far between. That hasn’t changed much since. (I think this was 2012). The middle class is barely hanging on in this country. We hear that time and time again. Jazz isn’t hanging on at all. When they gutted the middle class, they buried jazz. If it weren’t for rich people donating to museums and institutes, I don’t know if it’d be there at all. But then I go to the Blue Whale and think maybe it’s being born again. It’s not the sort of jazz I grew up with, but then it never is. The old fashioned jazz joint..tables, burgers, drinks, fans and a killer band. That’s Chuck Manning on tenor and the Charlie O’s house trio of bassist John Heard, drummer Roy McCurdy and pianist Andy Langham. Three sets (or was it four? ), no cover, two drink minimum. This entry was posted in All jazz and the jazzoid and tagged Andy Langham, Bogart, Bogie, Buick Opel, Cafe 322, Catalina's, Catalina's Jazz Club, Charlie O's, Chuck Manning, Deep Purple, disappearing middle class, economics, history of jazz, income inequality, inflation calculator, is jazz dying, jazz, Jazz Bakery, jazz clubs, jazz history, John Heard, Roy McCurdy, the middle class, Vibrato, Vitello's. Bookmark the permalink.